Veteran board member Betsy Atkins presents a compelling argument for proactively addressing ESG issues through formal corporate governance policies. Environmental, social and governance (ESG) issues should be a top concern of corporate management and boards. There was a time when a public stance on ESG issues was a public relations tactic. However, in today’s rapidly changing business climate, attention to ESG issues is becoming critical to long-term competitive success. Major institutional investors recognize this and are making it clear that they expect the companies they hold to take a proactive approach to ESG policies and messaging. In his annual letter to CEOs, Blackrock’s CEO Larry Fink wrote “a company’s ability to manage environmental, social, and governance matters demonstrate the leadership and good governance that is so essential to sustainable growth, which is why we are increasingly integrating these issues into our investment process.” During the 2017 proxy season, State Street Global Advisors (SSGA) put this ethos into action by voting against the re-election of directors at 400 companies that SSGA said failed to make any significant effort to appoint women to their all-male boards. 1. Strong ESG programs can increase stock liquidity. Individual and institutional investors alike are investing massive pools of capital in corporations that proactively govern and operate in an ethical and sustainable manner. Sustainable and impact investing is actively growing at double-digit rates. In fact, according to the US SIF Foundation, total U.S.-domiciled investments using sustainable, responsible and impact (SRI) strategies, reached $8.72 trillion, an increase of 33 percent from 2014 and a 14-fold increase since 1995. That represents about one of every 6 dollars under management. Investment research and consulting firms like Sustainanalytics and MSCI have developed indices that measure and rank companies based upon ESG criteria relative to their industry peers. The investment funds and ETFs that benchmark these indices are raising trillions of dollars to be deployed toward companies that execute sound ESG policies; these are long-term oriented shareholders that can potentially fuel demand for your stock. Many investment firms are also incorporating ESG evaluations in their portfolio risk assessment, which is a telling indicator that capital will continue to flow towards companies with strong ESG programs and practices. 2. ESG initiatives can unlock competitive value. Companies that recognize the importance of adapting to changing socio-economic and environmental conditions are better able to identify strategic opportunities and meet competitive challenges. Proactive and integrated ESG policies can widen a company’s competitive moat relative to other industry players. Starbucks (Nasdaq: SBUX) learned this as they were trying to expand their market share in China. For years after entering that market, Starbucks struggled to gain momentum on expansion. They stumbled upon the answer when they offered healthcare to their employees’ parents. Once they did that, sales growth skyrocketed and now Starbucks has 2,000 stores in one of the fastest growing markets on the globe. Executives who take steps to improve labor conditions, enhance the diversity of their teams, give back to their communities, and take a stand on sustainable environmental policies also strengthen the company’s brand. As millennials in particular become employees, consumers, and investors, they take note of good corporate actors and reward them with loyalty. 3. A proactive stance on ESG issues can keep activists at bay. Activists have used governance weaknesses as a tool in proxy contests and campaigns against companies for years, but increasingly they are targeting management teams and boards that fail to take a proactive stance on potential environmental or social issues. Companies that proactively address ESG issues can set the bar for the entire industry and at the same time help immunize themselves against activist intervention. Wynn Resorts (Nasdaq: WYNN) recently embraced their commitment to gender diversity by increasing the number of women on their board from one to four. With a board that is 36% female, Wynn is now in the top 40 S&P 500 companies in terms of female board representation. If your company does become the target of an ESG-focused activist, don’t despair. Activist investment firms and hedge funds are establishing their own ESG funds, such as ValueAct Capital and Jana Partners. Many of these investors are interested in collaborating with companies to develop ESG policies that unlock the long-term value we mentioned above. For example, Jeff Ubben, CEO of ValueAct Capital, recently joined the board of energy company AES Corporation to help continue the company’s transition to clean and renewable energy sources (following divestiture of its coal assets). 5. Companies that espouse strong ESG values tend to attract and retain the best talent. Millennials care deeply that the companies they work for (and the businesses they support) embrace values that are aligned with their own, and environmental and social responsibility are very important to them. Employees who are passionate about the organization, who are loyal, and who feel valued drive an intangible good will that strengthens the brand of the company and improves the overall productivity of the workforce. Identify the appropriate ESG criteria for your industry and your company. When developing an ESG policy framework, companies should not try to be all things to all people. Rather, identify three to five measurable ESG criteria that are material to your businesses and your constituencies, and are aligned with your corporate strategies. For example, an oil and gas company that is fracking should measure water and waste management and impacts on scarce natural resources. If your business is centered around service personnel as Starbucks is, social training on anti-harassment and racial sensitivity will make consumers feel welcome and strengthen the corporate brand. Wynn Resorts, as a business that delivers premium services to clientele, focuses on employment initiatives to ensure they attract and retain the best workforce: workplace safety and sensitivity, gender equality, a Women’s Leadership Forum, and diversity and inclusion. Wynn Resorts also addresses the environmental impacts of their large hotel properties. They recycle 95% of the water they use, and many properties are LEED certified. Wynn Las Vegas just announced a multi-use development, Paradise Park, powered by 100% renewable energy sourced from a 160-acre solar energy facility, making it one of the most environmentally conscious planned developments in Las Vegas. These organizations, as well as ESG advisory companies like Sustainanalytics and MSCI, analyze a broad range of criteria for each industry, only some of which include: climate change impacts, natural resource scarcity, supply chain management, labor practices, political contributions, board composition and workplace diversity and inclusion. The influence of proxy advisory firms like ISS and Glass Lewis over institutional investors has grown in recent years, so reviewing the governance scores they apply to your company can be another useful benchmark. Pursue inclusion within relevant ESG indices. As mentioned above, inclusion in ESG index funds and/or ETFs can boost demand and liquidity in your company’s stock. Once your company has identified the elements of its ESG framework, have your general counsel contact three or four ESG funds or ETFs to research their criteria for inclusion (and exclusion). From there, identify which of these indexes map most closely to your corporate strategy and to the priorities of the shareholder base that you believe represent your best long-term holders. Most ESG pools of capital apply their own unique set of inclusion and/or exclusion criteria to determine which companies to include. For example, to qualify for inclusion in the FTSE4Good Index Series, companies must be working towards environmental sustainability, supporting universal human rights, ensuring good supply chain labor standards, countering bribery, and mitigating and adapting to climate change. Companies that have been identified as having business interests in tobacco, nuclear weapons systems, or firearms, however, are excluded from that series. Tell your story and stay true to it. Once your company has determined the appropriate criteria for its ESG framework, the next steps are to establish metrics, measure them on a regular basis, and share progress publicly; otherwise, you will be accused of “greenwashing.” Companies that are guilty of greenwashing spin a PR narrative of high standards for environmental protections and human rights, but don’t walk the talk. Greenwashing is going to become harder to get away with as the SEC increasingly calls for companies to file corporate social responsibility and sustainability reports. Investors have a number of criteria they use to determine whether a company is greenwashing or truly integrating ESG policies in their business practices. Companies that are truly committed to executing their ESG policies make them a senior management priority of the CEO and general counsel, and tie compensation to ESG metrics. 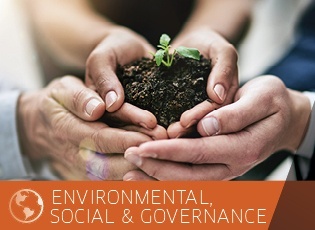 They voluntarily report ESG goals, and progress towards meeting them, to all stakeholders via the annual CEO letter, annual reports, internal corporate communications, and/or annual sustainability reports on the corporate website. Betsy Atkins serves as President and Chief Executive Officer at Baja Corp, a venture capital firm. She is currently on the board of directors of Wynn Resorts, Schneider Electric, Cognizant, and a private company, Volvo Car Corporation, and served on the board of directors of The Nasdaq Stock Market LLC and as CEO and Board Chairman at Clear Standards.